Tonight on TNT Major Crimes airs with their all new Monday, July 18, season 5 episode 5 called “Cashed Out,” and we’ve got your Major Crimes recap down below! On tonight’s episode, body parts are found burned in a barbecue pit at a Los Angeles park. On the last episode, unexpected developments lead to a new investigation when Flynn scouted for a new home and reached out to Provenza and Buzz for help. Did you watch the last episode? If you missed it we have a full and detailed Major Crimes recap, right here for you. 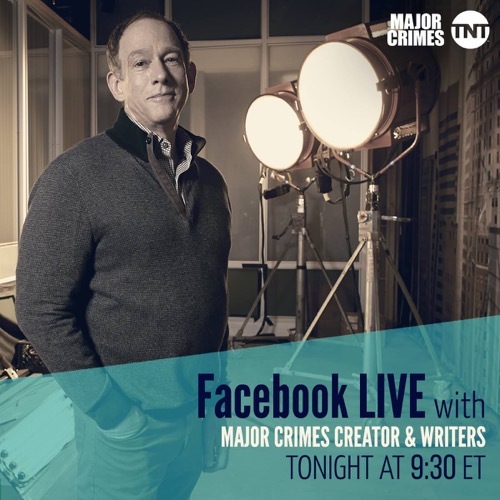 Tonight’s episode is going to be filled with action and you won’t want to miss it, so be sure to tune in for our live Major Crimes recap of the show tonight at 9 PM EST! While you wait for our recap hit the comments and let us know how excited you are for the season 5 episode 5. Tonight’s episode of “Major Crimes” begins with the team investigating a death where a burned and dismembered body was found in a barbecue grill during a child’s birthday party at a local park. Sanchez, who is in the process of being evaluated by the Department of Children’s Services as part of the adoption process, was late to the crime scene due to Children’s Services paying him an unexpected visit at his home. Sanchez tells Flynn that Children’s Services interviewed his mother, who told the officials that he once tried to kill his nurse. He tells the group that, in order to adopt a child, DCS will need to interview each of them first. The team members begin to piece together the clues of the crime scene: Tao thinks an accelerant may have been used on the body, while the coroner’s assistant believes that a buzz saw was used to dismember the body. The team then discovers a fully intact skull buried in the ashes of the grill which they hope can be used to identify the victim. In a flash-forward, DCS interviews Assistant Chief Taylor about Sanchez’s suitability as a prospective parent. The DCS official has concerns about Sanchez’s anger issue based on his reaction to the investigation where he is shown yelling and flipping a table during questioning. Taylor says that Sanchez is now being investigated internally for his inappropriate behavior. Back at the crime scene, the team finds a thumb in the ashes. The coroner’s assistant cannot give a precise time of death, limiting it to within the past eight weeks. At the morgue, the coroner tells Raydor that the victim was an adult male, that the dismemberment was done quickly with both a chainsaw and a handsaw and that the cause of death was a head injury. In another flash-forward, Flynn is interviewed by DCS about whether or not Sanchez has an anger problem. Flynn says that Sanchez’s outburst was simply a reaction to the gruesome details of the investigation, all of which began to unfold with the discovery of the thumb. Morales uses new technology to retrieve fingerprints from the thumb that was discovered. The team discovers that the victim was possibly Adrian Silva, a professional poker player. However, his social media says that he was in Thailand three days ago. Flash-forward scenes show Raydor being questioned by DCS about Sanchez’s outburst. Raydor says that, in that situation, there isn’t a right choice. Having obtained a warrant to search Silva’s home, the team finds the home empty. They discover online orders for both a handsaw and a chainsaw. Sanchez finds chainsaw nicks in the bathtub after obtaining a hair for a DNA sample from Silva’s hairbrush. Sanchez also finds empty ice bags which Tao believes were used to keep the body fresh. Despite a new social media post, the team believes Silva to be dead: all of his financial accounts have been cleared out and the dismemberment tools were purchased with his credit card on his laptop but none are present in the home. The team interviews social media consultants who were hired to manage and post on his social media. They say that they have received several emails and photos from Adrian in Thailand over the past few days. DCS continues to investigate Sanchez’s suitability as a parent by speaking to Tao and Buzz next. Both say that he would be an excellent parent, though they may not agree with his actions. Tao discovers that Silva’s emails weren’t sent from Thailand but from a local security firm who the team suspects were financial backers for Silva’s gambling. Provenza is then questioned by DCS and states that Sanchez did not violate his command during the investigation. Raydor and Rusty discuss social media in the investigation. Raydor and Tao then question the owners of the security firm about Silva. They say that Silva owes them $30,000 for backing him in tournaments. When questioned about the emails originating from their firm, the owners say they were probably hacked. Buzz discovers that the photo of Silva in Thailand was an old photo he had taken years ago in Malibu. He had also been taking out money from his account with the firm. The DCS next questions Sykes who passionately defends Sanchez. The team finds casino footage of a man wearing sunglasses withdrawing money from a casino ATM. Also, the DNA from the hair in his house matched the DNA of the victim. Raydor discovers that one of the social media consultants, Glen, went to school with the victim and the sunglasses worn by the man at the ATM match the ones he was wearing while being questioned. Glen’s boss says that signing Adrian saved Glen’s job. The team searches Glen’s apartment. Glen shows up at work while the detectives are talking to his boss and, once he spots them, flees. Sanchez chases after the suspect, leaving Provenza behind. Glen grabs a pedestrian and holds a gun on her, saying he will shoot unless Sanchez backs off. Sanchez holstered his weapon to prevent any civilian death, but is able to talk the suspect into releasing the hostage. Glen is arrested. Later, while being interviewed by DCS, Sanchez explains his reasons behind lowering his weapon by citing the possibility of civilian and officer death and saying that he will continue to try to make the right decisions if he is allowed to become a father. Taylor tells Cynthia that the reason behind Sanchez’s investigation wasn’t for disobeying orders: he was being evaluated as a potential recipient for a medal of honor. Rusty tells Cynthia that Sanchez is a great man and will be a great father.